I had submitted these redemptions almost a year ago for 2010-11 Upper Deck Artifacts Redemption RCs. Upper deck seeds these redemptions randomly in hobby boxes of Artifacts cards. There are mystery or wild card redemptions which makes the product interesting. I must have bad long term memory as I had forgotten about these until they showed up in my mail box one day. 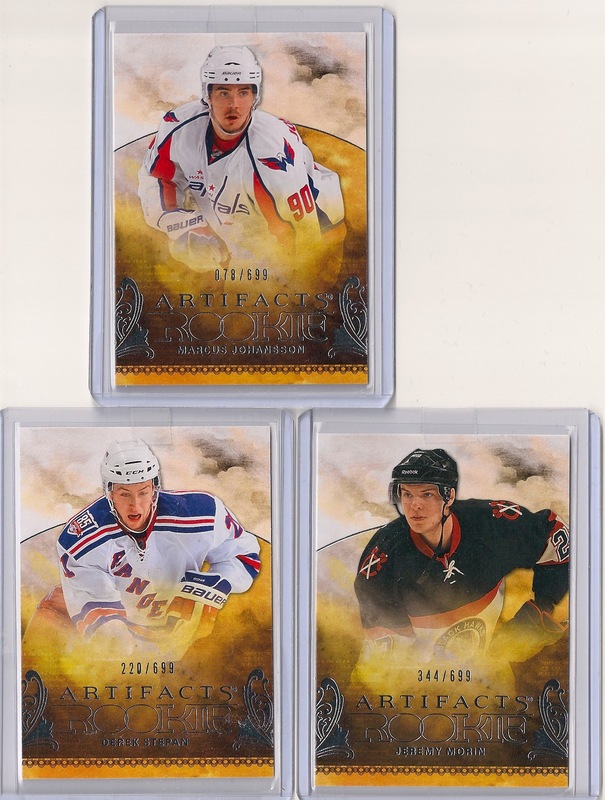 The redemptions were for Marcus Johansson, Jeremy Morin and Derek Stepan RC’s numbered to 699. However we are never truly sure of how many actually get redeemed. This leads me to believe this is why some people still sell redemption cards as actual RC’s many many years after the fact. Regardless, it was still fun to find these cards in my hands. Here is what they look like. Note: All have been sold since on eBay. Enjoy!